Ello pickle well im Rain I love art. 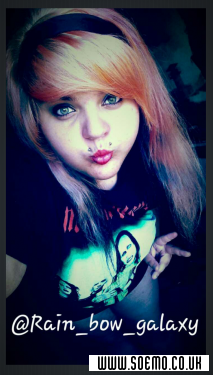 People call me scene emo, im just me. I have depression issues but I can be super bubbly at times. I have Instagram follow me @Rain_bow_galaxy. I dont like rude people so if thats what ur into man bu bye. I cut and dye my own hair all natural not clips all real. I work for haunted houses doing special FX makeup. im 16 and in college. So ya always open to new friends. No creeps plz.